Woody Allen has had many highs and lows throughout his film career. He’s made some classics like Annie Hall, Hannah and her Sisters, and most recently Midnight in Paris and Blue Jasmine; however, he’s also made some massive blunders like Hollywood Ending, The Curse of the Jade Scorpion and Whatever Works. His latest, Irrational Man, falls strictly in between – it’s neither among his best work, nor among his worst. It is a completely acceptable middle-ground for the filmmaker, with its equal share of strengths and weaknesses. The film puts an even amount on focus on Joaquin Phoenix and Emma Stone’s characters, the former being a college philosophy professor who’s lost touch with his own well-being, and the latter being one of his students who finds himself increasingly interested by him, alienating her boyfriend Roy (Jamie Blackley) in the process. Both souls mix and match in a few ways, and it seems like it’s going to take the typical rom-com route – that is, until they overhear a woman’s grief caused by an unfair judge, and Phoenix’s Abe Lucas decides to take matters into his own hands which simultaneously gives him a newfound meaning in his life, but also puts him at eventual odds with Stone’s Jill. Much like Quentin Tarantino, Woody Allen is a filmmaker who can be unpredictable with some of the choices he makes with his films – a film of his which you think is going to be an all-round comedy about a certain topic soon turns into something completely different and unexpected. Irrational Man is no different, with the elements of black comedy soon seeping in to a film that could have so easily been Allen’s trademark romantic affair. Those particular beats are still present, but when the time comes to flip the switches it’s a smooth enough transition that doesn’t ignore what came before it, and even as the film and its co-lead character’s questionable actions start to dominate there is still a sense of passion as to how Allen stages and crafts what we see on screen, albeit not as strongly as some of his better work. In an age where almost everything is given away by a film’s promotional material (Terminator Genisys being a magnificent recent case study), it’s refreshing that Allen still manages to keep his cards fairly close to his chest until the time comes to share them with the world. His unpredictability, even as he approaches 80, is something to be admired, as is his ability to pick out good actors to play his parts. Stone, on her second consecutive teaming with Allen after last year’s forgettable Magic in the Moonlight, is as adorable and sparky as ever, while Phoenix copes well as he wrestles with a character that’s by most accounts not easy to like, even after he starts to perk up his downbeat attitude. Parker Posey, as a fellow married college professor who occasionally hooks up with Abe, has some good moments when the film allows itself to focus on her, and Blackley is decent enough in an underwritten role. However, Irrational Man is far from perfect, and there are just about as many things that don’t work as there are things that do. For instance, much of the dialogue is very heavy on the exposition, especially the majority of Stone’s lines which in some way connect back to her increasing fascination with Abe (it comes across as more obsessive than romantic); this is a common trope with Allen, who sometimes feels like he’s writing a stage play rather than a screenplay and often confuses the two very different writing mediums, and becomes rather irritating after a short while. Another instance is the lead romance; there are no harsh words against the two actors, who have a fine chemistry, but the age difference between Phoenix and Stone (roughly 15 years between them) is hard to ignore and has the effect of making one feel a little uneasy – and knowing what we know about Allen’s alleged past dalliances with younger women, it just makes things a little more creepy. Irrational Man will ultimately divide audiences, as it did with this reviewer; it feels strictly tailor-made for loyal fans of his previous work more than anything, bringing out both the best and worst qualities of his overall talents. We wouldn’t recommend this to anyone who’s never seen a Woody Allen movie before, since there are much better starting-off points to choose from and this one is just, well, irrational. 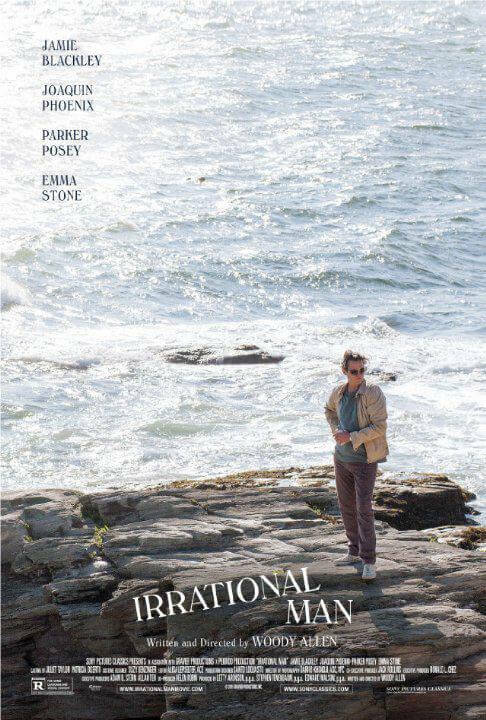 Irrational Man is neither Woody Allen’s strongest nor weakest project but finds the uneasy middle-ground, with a talented cast working off the filmmaker’s refreshing unpredictability but also his flawed methods of storytelling, both of which seem to be at odds multiple times during this particular movie.